Windows 8 and HTML5 is this a deja vu of the 90's and Visual Java? A few weeks ago I read about Microsoft making Windows 8 UI and platform based on HTML5. Meaning, developers should adopt towards HTML5 over say the previous product they were pushing really hard - silverlight. This about face has a very interesting parallel to the past which I will digress into shortly. Silverlight was destined to be the solution to all the deficiencies of developing within the stateless http applications. The technology embraced the best features of existing technologies unifying them with a serious amount of innovation into a mature platform many developers swore as the future of web technology. It is declarative using XML (XAML to be specific), it has a rich presentation similar to flash but much better as it was SEO friendly among other things, it is a runtime which is cross platform so Linux users just as much as Windows users would be able to run these apps with the same consistency as Adobe Flash today. They even borrowed the best from their own .NET platform and cherry picked the essential APIs (to keep the runtime as small as possible). So, with all this innovation and push towards silverlight, even including it as the basis for their new mobile platform, it's understandable developers are in uproar as to why Windows 8 will move towards HTML5 instead. A few hours ago, I came to a realization. I'm not second guessing Microsoft, but it sure feels like deja vu. Back in 1996 or 1997, Microsoft created their first Visual Studio integrated product. They called it "The Year of the Developer" and I probably still have the nifty poster they included in the box somewhere. In short, they decided to integrate all their development tools similar to how they integrated all their office products. The idea was simple and novel. Sell the suite cheaper than the individual products and give a Word user a new application to play with (Excel). The same applied to the development tools and both integrated suites were a phenomenal success -- and still are as we are still working with these integrated suites to this day. As part of this integration, Microsoft included Java as a language to develop with and build a large class of libraries so Java could work with Windows (call this the precursor of .NET). So this suite contained Visual Interdev, Visual C++, Visual Basic, and Visual Java. As we now know, a large legal battle with Sun eventually forced Microsoft to remove the Java name and instead change it to J#. The core argument from Sun was very simple -- Microsoft cannot call it "Java" if it is not Java from all the Microsoft specific windows libraries. By the time the settlement came around the damage was done. Java was climbing up stream from an adoption perspective with development environments such as Eclipse either non-existing or nowhere near the maturity of Microsoft's development environments. So with Microsoft's marketing muscle and center-of-attention position they had before, they were able to get a vast majority of developers to develop Java with Visual Java. Why not right? It had all the environment features were developers were used to such as intellisense, was binary compatible with Java so long as you didn't use Microsoft's extensions, etc. Well, many already know the end of that story and transcripts of the various cases against Microsoft essentially shows Microsoft intentionally derailed the adoption of Java enough, keeping Visual Java stuck on Java 1.1 as declared by BillG himself in key emails, while they developed their response. This put the breaks on the evolution of Java significantly, especially at a core juncture where Sun was pushing Java 1.2 with it's revised event model to better handle large scale applications. Microsoft literally stole the spotlight using Visual Java and suite as a tool. This derailment and time-buying was all Microsoft needed to build their version of the runtime -- calling it .NET. To ensure they lure all their existing developers C++ and VB, their model was to have all languages compile to a common byte-code. In this process, their new language, C#, very similar to Java, will take center stage in the new developer suite. So how does all this relate to today? Well, for quite some time Microsoft has been pushing silverlight. Why the about face to HTML5 for Windows 8 if they have a great following and even included it for their new mobile phone platform? I hope I'm wrong, but I feel it may be a repeat cycle of what occurred with Java. 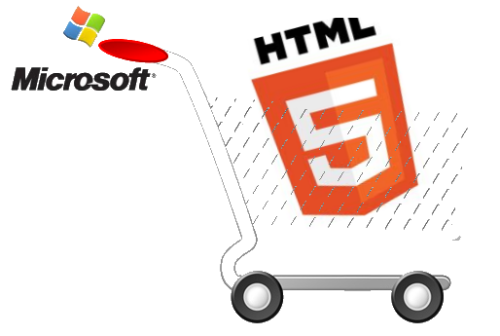 Microsoft may see HTML5, the richest application framework-to-date for building desktop-like applications on the web, as a threat to their desktop dominance. Their celebratory sabbatical for winning the browser wars, with over 90% market share at peak, caused them to leave Internet Explorer in limbo on version 6 while the rest of the world was moving along with the evolving web standards. They even moved the developers off Internet Explorer to the Windows group. This allowed for a slow shift towards using standards based browsers with Firefox taking a decisive lead. Following Firefox many others popped up -- including Apple with Safari and Google with Chrome utilizing rendering engines such as WebKit while others such as Opera built their own. Developers started alienating Internet Explorer by building sites with the emerging standards -- after all standards worked with all browsers and for the most part, so long as it it's not too fancy, worked with Internet Explorer too. If we fast forward to today, Internet Explorer is actually behind in market share in Europe and has lost significant market share domestically as well. So it's clear to me, either two things are happening with Microsoft and HTML5. Either Microsoft it truly adopting standards and making genuine strides in interoperability with other technologies and platforms like Linux and even building it into their next Windows or they are simply attempting another coup. I shared this with a friend and colleague via text (I'm not sure if he wants me to publish his name so I blurred it out), but he always has a valid opinion on matters and his response was decisive. There were four consecutive texts; each with more emphasis than the previous so he clearly sees it as possibly a deja vu. Only time will tell where the truth lies. Inktel Direct announced 100 days of innovation just about 100 days ago. See their blog post for more information. In short, various groups were created with the idea of applying Ideo's principles and create or change something in an innovative way. Most people have the desire to improve in one shape or another. Improvement, aside from formal and self directed means, relies heavily on the interaction and feedback from others. Traditionally, feedback is given every quarter or semi-annually within corporations. While this is a good for self-improvement, it's traditional and doesn't keep up with the "immediate" times of today. By the time you receive the necessary feedback, weeks and months have passed potentially missing out on other opportunities to apply such feedback, or worse yet, the feedback is no longer applicable and is either omitted or simply useless. GiveMeFeedback.com addresses the gap to request, give, & receive feedback immediately after an event occurs where feedback would be beneficial in a seamless and friction-free click-friendly manner. 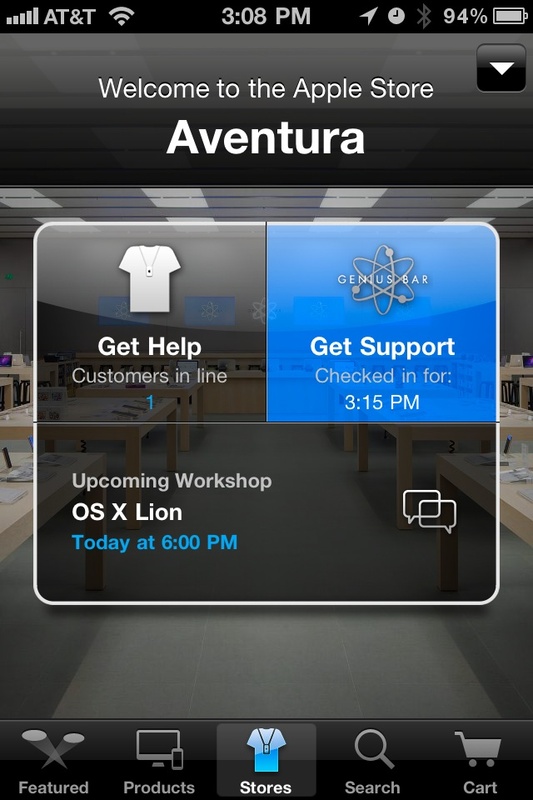 Apple Revolutionizing Retail Support with iPhone & GPS! 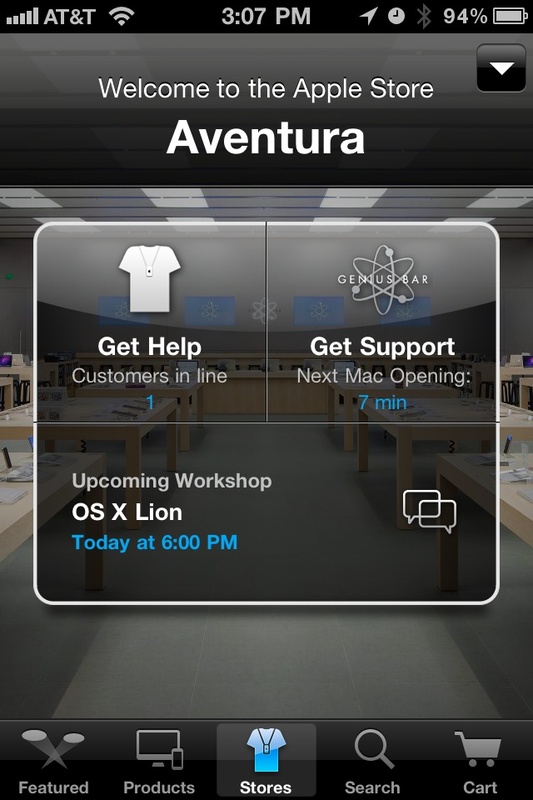 I was at the Apple store the other day and was quite surprised the Apple store iPhone app interacts with the store once you are within the vicinity. 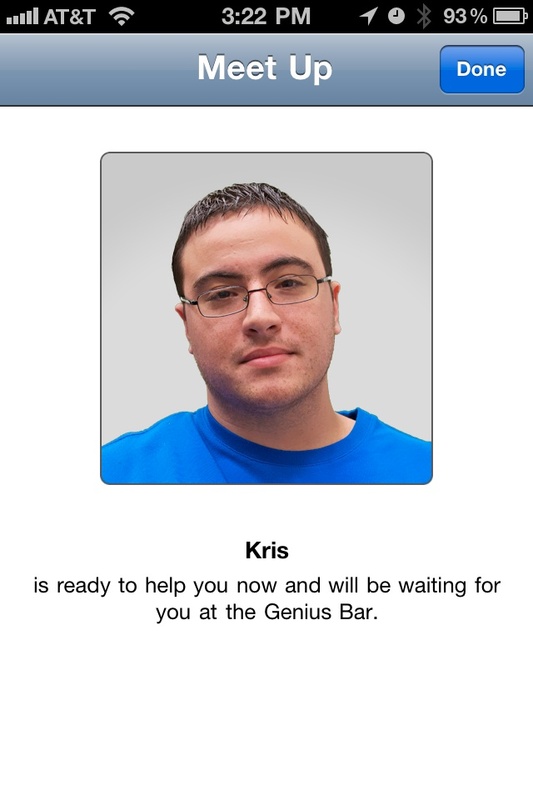 I was going for a Mac genius appointment and the process was so smooth words cannot do it justice. Checkout these screenshots I took of the whole process. The pictures left to right speak for themselves...super smooth. Notice iPhone's time indicator from for the duration of the screen shots from 3:07 to 3:22. In this video, I diagram the various options for connecting an iMac 27" (as a display in target display mode), a Cinema Display, & the new Thunderbolt Display to a MacBook Air or MacBook Pro with thunderbolt port. It turns out, you can achieve the same results as a thunderbolt display (having to connect only a thunderbolt cable) using either an iMac 27" or Apple Cinema Display. In the video below I diagram the options and actually uncover some benefits in connecting a Cinema Display or iMac over utilizing the newly released Thunderbolt Display. Windows7 may drain battery faster than Max OSX on MacBook Air 11"
I was intrigued at how fast the battery drained while running bootcamp on my MacBook Air 11" (2011 model). There are various blogs discussing how Windows is not SSD friendly, particularly Vista, however I felt this would have been resolved with the latest version of Windows and/or latest service packs. After various trials and errors, I achieved reasonable battery life by turning off Windows Search which has indexing running in the background. Simply turn off the service called "Windows Search" and change it's startup to either "Manual" or "Disabled". I have a MacBook Air 2010 model with the mini display port. At the office we recently ordered an iMac with the thunderbolt port. On occasion, I want to use my MacBook Air at the office so I was exploring the option of using the iMac 27 as an external monitor via the thunderbolt port. The latest macs, both the 2009-2010 models using mini display ports as well as the 2011 using the thunderbolt ports support a feature referred to as "Target Display Mode". In essence, when properly cabled with either of the two cables, hitting Command/F2 will enable it. One thing to note, when using target display mode and mirroring, the resolution will default to the lowest resolution device. In my case, I had a MacBook Air resolution displayed on the iMac 27 which didn't look great for extended reading. There are two ways to achieve target display native resolution. One way is to close the MacBookAir and tap on the mouse to wake it up. When it wakes up, it will adjust to the target display resolution. With the Thunderbolt MBA, you will need to have the magsafe power plugged in. I am not sure if this is required also for the Minidisplay MBA. The second way entails setting up a second monitor side by side (uncheck mirroring). The problem here is, if you want to ignore the MBA's monitor and solely use the target display, the dock and menu bar are annoyingly on the MBA monitor making it very cumbersome to work. We accidentally came across a nifty solution by trying out various options. We discovered, just like you can move the orientation of the second monitor, you can move around the menu strip too. So while viewing the monitor orientation window, click and drag the little white strip above one of the monitors and drag it to the other. This in essence moves the doc and menu over to the target display monitor. At this point, you can either dim the brightness of the MBA and you are all set to go. Thanks! Unfortunately WordPress didn't make it convenient for migrating blogs out of their system. As a consequence, I'm linking to the original posting for this topic so others can have access to the comment history. Moving forward I will be updating this blog. Wouldn't it be great if you could edited a document at work and seamlessly can continue editing it on your laptop while waiting for your flight home and finally finish proofing it on your home desktop computer without copying it or transferring it from one computer to the next? And once completed, regardless of size, deliver it with the same ease as an email? If so, the next few minutes will be worth your time Sharing has been around since the dawn of time. As we evolve in this digital world, how does one share documents with ever increasing efficiency? In the old times, one would make a xerox copy and deliver by mail while today one may simply email them a copy they already have on their computer. Notice the there are two important concepts here, (a) making a copy (xerox or copying a file) and (b) transporting the copy (mail or email). The focus of this post is on the later and how transporting has been completely reinvented and why one needs to break from the past and leverage the changes time brings to be effective in every day work. Briefly looking at history you can easily see how disadvantaged one would be if they hadn't adopted and changed from the means of the previous era. ** how people transport large files for themselves typically to/from work In the past, one would have to carry a briefcase, a floppy or cd, or more modern times a USB drive. We'll the next era is here and one of the first successful incarnations of this era's transportation concept is a company called DropBox. DropBox is quite simply a folder on your computer which is automatically and seamlessly available on all of your computers -- including your mobile devices. Unlike having the files reside in the cloud like google docs requiring connectivity to the internet for accessing them, they reside locally on your machine and are transparently replicated to your other machines in realtime as modifications are made. Oh yea, forgot to mention, when you are finished editing the document and are ready to share it with someone, simply right click the file to get the public URL to the file and send this link to whomever you would like share the file -- the era of attachments which are too large to email is also over. During Apple recent press conference showcasing all their new hardware and software toys, Jobs introduced a new feature called High Dynamic Range photos (HDR) where the iPhone combines an under exposed picture with an over exposed picture making a strikingly beautiful combined picture. 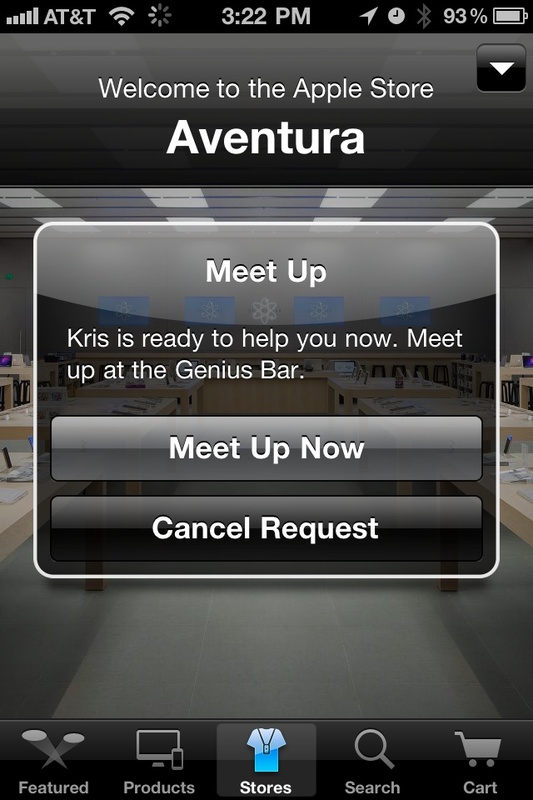 Well, as part of his presentation he also previewed iOS 4.2 to be released in November. As he introduced it, he mentioned all the various features coming to the iPad ..including multitasking, folders, new printing feature, etc. and HDR photos. How can HDR photos exist if the iPad doesn't have a camera?...Well that's the new guessing game... I say we have a 7" iPad coming to town in November. If it were the same size iPad, this may alienate some existing iPad customers, but if they introduce a newer model with slightly new hardware features, they are set for the holiday season smash! iPhone 4 antenna glitch real or not? Much uproar has occurred with the latest iPhone and possible antenna glitch since it's release on June 24th. I personally haven't experienced any issues as I bought the Apple case which conveniently shields the iPhone from any human interference with it's exposed metallic antenna. However, in lieu of various blogs and spurious examples of how the antenna fails to function properly when touched in the special "death grip" area, I decided to conduct my own set of tests and reach my own set of conclusions. This is the area in question among all the news media. 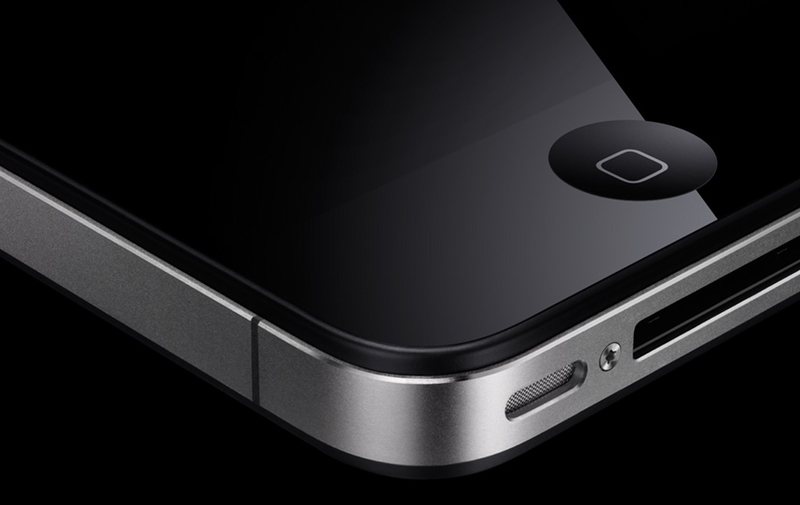 First, the antenna system is the casing of the iPhone. As Jobs mentioned in his presentation, the core frame structure is the metallic antenna frame. So there are two pieces of metal separated in two areas. One of the areas is the lower left side with the phone facing forward, and the other is the the slit on top near the microphone jack. When I performed my own test, I was able to lose a few bars of signal repeatedly. I didn't drop a call or lose call quality, but the bars did reduce from five to about three. Since the two antennas are separated in two different locations, one must assume the conductivity issue should also have a similar effect if touched on the other slit on top. When touching the slit on the top however, no effect whatsoever occurs with the signal strength bars. This really spurred my curiosity because I was expecting to have the same results -- at least partially. With my continued intrigue, I decided to perform some speed tests while on 3G as some others have done. In doing so, since the speed test refreshes continuously, I came across an a definitive conclusion -- 3G data could be affected 100%. As shown in my video test below, I can effectively stop the progress of the test by simply touching the affected area and then allow it to continue by releasing it. Curiously, this effect again doesn't materialize when we touch the top slit which also separates both antennas. So the next step was to switch to Edge network. More surprisingly, when switched to the Edge network, the lower left touch has no effect whatsoever also. I'm not a signal expert, but I would presume the 3G has a more sensitive or higher frequency signal which is more sensitive to the touch over the Edge signal. 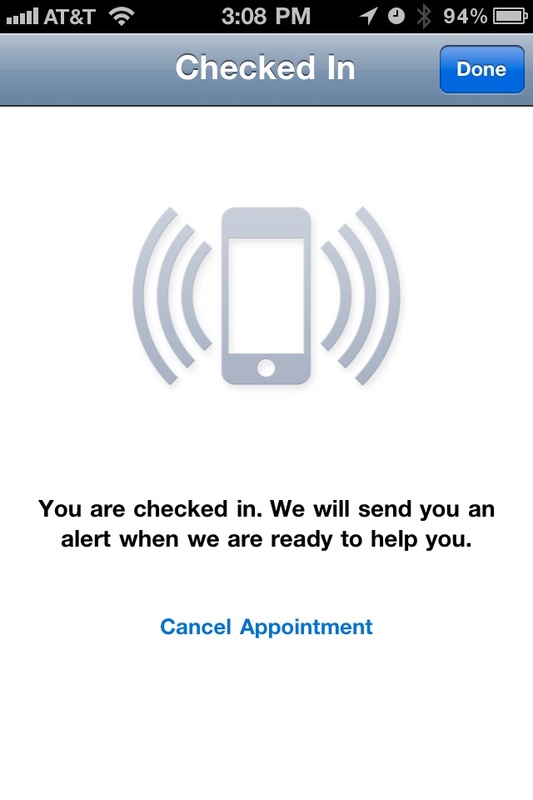 If this can be automatically tuned when touched vs. not touched via software much like a noise cancellation microphone removes ambient noise in a regular phone call, then we may have a software solution.